RUSH: Michelle (My Belle) has been dispatched by the regime to run out there and basically engage in a campaign of personal destruction. I’m looking for the story even now. I think I put it toward the very bottom because in my mind I wasn’t even gonna talk about it, but now I must. So I’m searching for it. Maybe I put it near the top. At any rate, let me look at this from another different perspective: The Democrats and Michelle are running around attacking the Republican base, attacking “the 1%,” attacking the achievers of this country: The people who are self-reliant, the people who are working, the people who are paying taxes, the people whose income is being redistributed. Those are the people under assault, those are the people being attacked — and it’s time that everybody on our side woke up here and understood that we are in the majority. They’re base, the Democrat Party base somehow… Well, not “somehow.” I understand it. The Democrat Party base is immune from discussion. Not here. Of course not here. I’m talking about in initial Republican ranks. Why is the Democrat base off limits? “Well, because they’re the poor and the disadvantaged and the put-out and the put-upon.” Is that who they really are? And why is it that it’s hands off the Democrat base? Why isn’t it proper point out that the Democrat base is made up for the most part of the nation’s losers? The Democrat Party base is what is destroying this country, and the effort to coddle them and to take care of them and to continue keeping them in that position that they’re in of total dependence, no opportunity at acquiring wealth or achievement. The rest of us have to pay for their crazy, stupid life choices. The rest of us have to see our wealth and income transferred and redistributed to people who’ve made rotten choices. (Among the worst choices they’ve made is to vote Democrat.) The Democrat Party base is the nation’s losers, and we need to start pointing this out. You want to start talking about people not paying their fair share? Yeah, it’s the Democrat Party base that’s not paying their fair share. It’s the 47% or whatever the number is that don’t pay income taxes who are not paying their fair share. It’s not the top 1%. It’s not the people working. It’s not people getting up every day and doing everything they can to make this country work. They are not the ones who are not paying their fair share! The Democrat Party base are the people not paying their fair share: the 49%, 47% that are paying zilch, zero, nada; and they’re the ones that we’re told ought to get everything. They’re the one who ought to get all the benefits. They’re the ones who ought to get all the transfers of wealth. Somehow, they’re in their circumstance because of the 1%. “The 1% stole everything those people used to have!” Wrong. Those people are in the positions they’re in because they have made rotten life choices, and they have had those choices confirmed and affirmed by the Democrat Party who want those people dumb and stupid and unproductive. That’s who’s not paying their fair share, and that’s what the Republican Party needs to start pointing out. “This is a war,” as James Carville would say. American politics is a war. We don’t treat it that way. Not us. Not you and me, folks. I’m talking about the people that represent us in large part. I, for one, have had it. I have had it with the people who are working in this country being called the people who aren’t paying their fair share. I have had it with people who are getting up every day and slogging against every effort this administration’s making to kill this economy, to still go to work every day, make this country work. They are not the people who are screwing up. They are not the people who are not paying their fair share. They’re doing more than their fair share and they’re facing obstacles like they’ve never faced before in this administration, and still they get up and they go to work every day. It offends my sensibilities to hear these people described as not paying their fair share, because don’t believe for a moment that the Democrats simply mean that 1% is not paying their fair share. They’re after everybody that’s working, they’re after everybody that’s paying taxes, and they want to raise them. And, meanwhile, the people who don’t work, the losers that make up the Democrat Party base, that’s for whom we’re supposed to have compassion and sorrow, because of their life choices. We are the majority in this country, and we are the ones who make it work. I’m tired of being blamed, flat-out tired of having the finger pointed at me and you and everybody else who’s working or trying to work or trying to get a job. Instead, what do we do? We’re supposed to have sympathy and compassion for a bunch of whining losers! We’re supposed to feel sorry for a bunch of people who are where they are because they have chosen it. And, as I say, their number one choice has been to vote Democrat. You get what you pay for. RUSH: Here’s that Michelle Obama piece. It’s actually an opinion piece by Joseph Curl in the Washington Times, and it’s entitled: A Very Angry First Lady Michelle Obama — Michelle’s back, and she’s madder than ever. She was already pretty angry, seemingly unhappy with just about everything. As her husband wrapped up the Democratic nomination in 2008, she let fly her real feelings: ‘For the first time in my adult lifetime, I’m really proud of my country.’ A few months into her job as first lady, her French counterpart asked how she liked the gig: ‘Don’t ask!’ she reportedly spat. ‘It’s hell. I can’t stand it!’ She even seems to be mad at her silver-tongued husband. When the two were to set off on a luxurious 10-day vacation to Martha’s Vineyard, she left early — four hours early — and flew up alone. “And those private vacations. She’s traveled to some of the world’s most plush resorts, taking 42 days off in the past year — that’d be eight weeks of [vacation] time if she held down a normal job. Now, she is ready to spew her bilious disgust with America on the campaign trail. 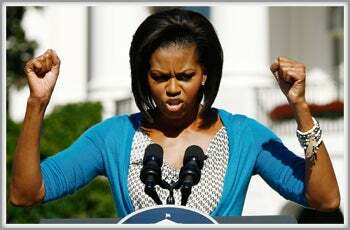 A dignified, transcendent first lady? No chance. Michelle is going to break with a hundred years of tradition and play the role of attack dog, heaping derision on her husband’s political opponents like no other first lady before her. And it’s already begun. Mad Michelle this week popped down to Davis Island, Fla., to hobnob with the very people her husband despises — the 1 percent. I’ll tell you who your base is, Ms. Obama, the nation’s losers, the nation’s takers, the people riding in the cart being pulled by everybody else. Your base is the group of 47% of Americans that pays no income taxes. Every person in this country who is seeking success, every person in this country who is working, every person who is doing everything they can to see to it that this country works has been targeted by you and your husband and your party, Ms. Obama. Those are the people not paying their fair share, you say? The people not paying fair share are the people that vote for your husband. The nation’s losers, the nation’s takers. Joseph Curl in the Washington Times. When’s the last time you read a piece like that that was a direct hit on the first lady? I don’t even think the left went after Barbara Bush that badly. They went after Nancy Reagan for the china in the White House and because she had an astrologer.